“Induced pluripotent stem cells (iPSCs) avoid many of the restrictions that hamper the application of human embryonic stem cells. Also, the donor’s clinical phenotype is often known when working with iPSCs. “Mutations in nuclear and mitochondrial DNA acquired over the donor’s lifespan and during the reprogramming process might persist. It is not yet known how strongly the variable genetic background of individual donors affects the reprogramming process and the quality of resulting iPSCs. A low number of donors and cell lines is a general problem in almost all research articles on the topic of iPSCs. This combined with the lack of a standardised protocol for optimal iPSC derivation, culture and quality control makes any comparison between different publications very difficult if not impossible. Especially, since it has been shown that many factors influence the quality of iPSCs and iPSC-derived cells, such as time and cell type used for reprogramming, time in culture, or reprogramming modality. 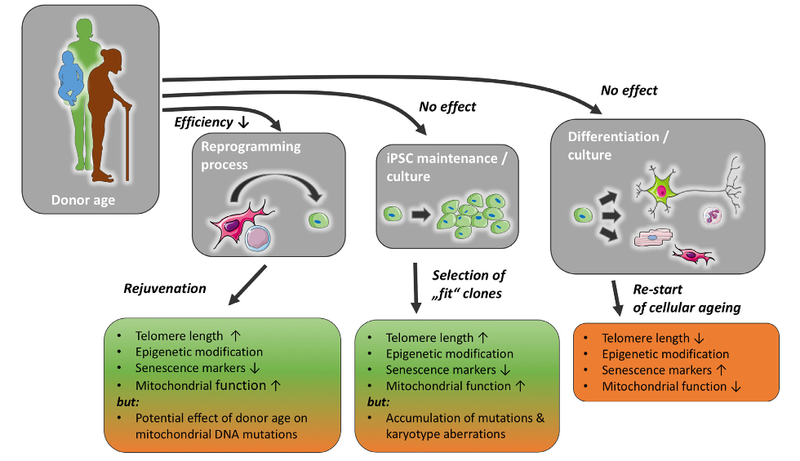 A problem lies in the retention of tissue-specific epigenetic alterations which in part could be caused by incomplete reprogramming and might be improved by vigorous quality testing and careful selection of iPSC colonies during reprogramming and passaging.